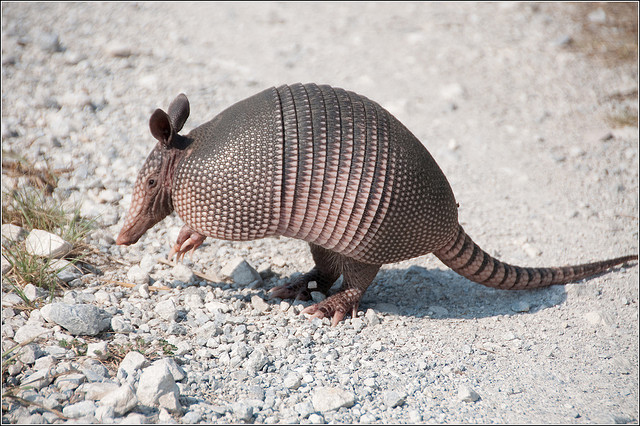 Nine-banded armadillo in Aubrey, Texas; photo by Rich Anderson on Flickr (noncommercial use permitted with attribution / share alike). A distant cousin of the sloth and the anteater, the nine-banded armadillo is the only species that occurs in North America. A bony, scaled shell protects the armadillo from predators. Originally native to South America, the nine-banded armadillo now ranges as far north as Texas, Oklahoma, Kansas and Louisiana. The other twenty or so armadillo species remain in Central and South America. RESOLVED, That the 74th Legislature of the State of Texas hereby designate the longhorn the official Large State Mammal of Texas and the armadillo the official Small State Mammal of Texas.